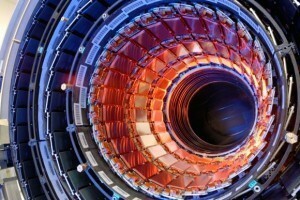 Tomorrow CERN is expected to announce the results of the search for something called the Higgs boson. So just what is the Higgs boson, and why would finding (or not finding it) be such a big deal? For that we have to cover a bit of background on particle physics. You are likely familiar with the basic concept of atoms. Atoms were once thought to be the building blocks of everything, and it was assumed that atoms were indivisible. We now know that atoms are made up of a nucleus of protons and neutrons, surrounded by a cloud of electrons. Often the electrons are pictured as orbiting the nucleus like planets, but that’s not really how it works. As far as we know, electrons aren’t made up of anything smaller. They are a type of elementary particle. Protons and neutrons however do have parts, known as quarks. Protons and neutrons are made of 3 quarks each, so they are not elementary particles. The quarks are the elementary particles. It turns out the electron and the quarks that make up protons and neutrons (known as up and down quarks) are not the only elementary particles there are. There is also the neutrino, which has similarities to the electron but doesn’t have electric charge. Electrons and neutrinos are part of a group of elementary particles known as leptons, and it turns out there are six known leptons. It also turns out that there are six types of quarks (up, down, charm, strange, top and bottom). So it seems that everything in the universe is built out of the 6 types of quarks and the 6 types of leptons. Twelve elementary particles that are the building blocks of the universe. Of course this raises the question of how these particles interact. In Newton’s gravity, masses interact through the gravitational field, however in particle physics a field is produced by a type of particle known as a gauge boson. There are four types of fields in the universe: gravity, electromagnetism, weak nuclear and strong nuclear, which means there are four types of gauge bosons: the graviton (which has never been observed directly), the photon, the W boson, and the gluon. The basic idea is that particles move because of boson interactions. So, for example, if an elementary particle has charge, then the gauge photons interact with it, which is why two charges attract or repel each other. Given all that, what about mass? You might say that since gravity is due to the graviton boson, gravitons must produce the effect of mass just like photons produce the effect of charge, and you’d be partly right. However there are actually two properties of mass. One is that masses attract each other gravitationally. The other is that a mass resists changing its motion (known as inertia). It is this second property that makes larger masses harder to move than smaller ones. Gravitons determine how masses interact gravitationally, but gravitons don’t determine a particle’s inertia. So there must be a fifth type of gauge boson that determines a particles inertial mass. 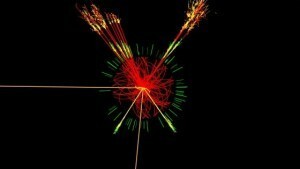 This new type of particle is known as the Higgs boson. So why is it so important to find the Higgs boson? It turns out that all the quarks, leptons and bosons are part of a theory known as the Standard Model. If the standard model is correct, then the 12 types elementary particles are the only ones that exist, the four gauge bosons tell them how to move, and the Higgs boson determines their inertial masses. 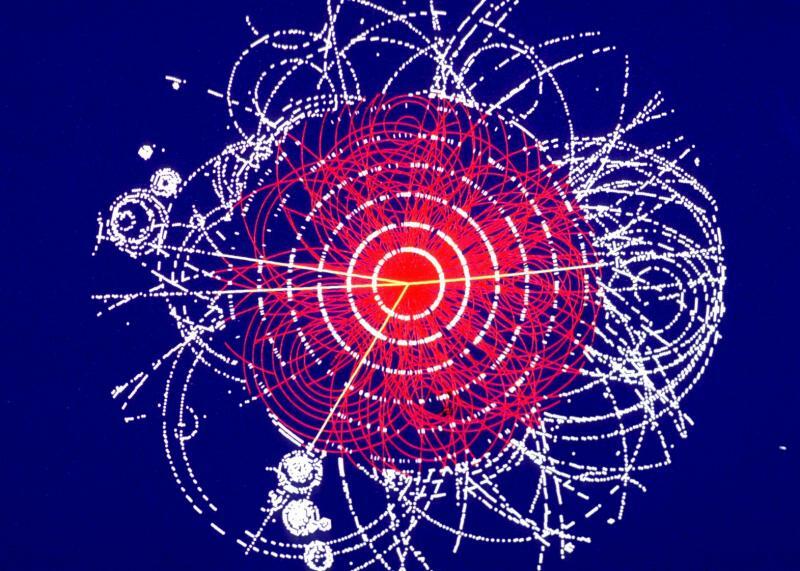 The Higgs must exist, otherwise the standard model is wrong. The theory also predicts that if the Higgs boson exists, the Large Hadron Collider at CERN must be able to observe its effects. That means that either we find the Higgs boson (and the standard model is right) or we don’t find it (and the standard model is wrong). Since the standard model is the foundation of all particle physics, proving it or disproving it is a huge deal. As in Nobel prize big deal. That is why everyone is so keyed up about the announcement tomorrow. Of course there is a third possibility for tomorrow. It could be that CERN announces the discovery of something, but something that isn’t the Higgs. We’ll just have to wait and see. Either way, once they announce things, I’ll try to write a post talking about what it means. Note: This post was written on 3 July 2012. It is posted here just to have a copy.